Works with ForeFlight's Synthetic Vision Subscription, FlyQ, Avare, iFly, FlightPlan Go,WingX and many more. Check out stratux.me for a full list. Fully Assembled & running the latest Stratux AHRS Software. *Assembled in the United States. All parts are genuine and are of the highest quality. •Includes:- x1 Fully Assembled Stratux Dual Band ADS-B In Receiver with WAAS GPS and AHRS + Fan Controller, x1 Soft Carry Case, x1 Suction Cup Mount, x1 Internal GPYES, x1 External GPS (yes you get 2 GPS units)!, x1 Non-Slip Battery Strap, x4 Rubber Feet, x1 Pass-Through 6000mAhBattery Pack, x1 Flash Drive With Instructions & Updating Software, x1 Tool Set, x1 Installed and Pre-Flashed Micro SD Card. 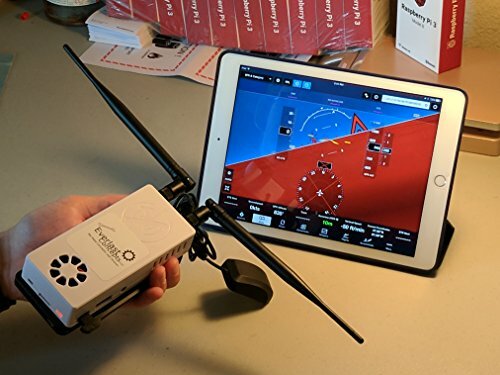 *Works with ForeFlight Synthetic Vision* Money from each unit sold goes to Cyoung (the creator of Stratux) - to help fuel Stratux's growth and help to further development. Over $2,000 reinvested into making your Stratux experience better. Our Stratux's use Dual-Band High Gain Antennas and run on the Raspberry Pi 3. Instructions can be found on the included Thumb Drive along with the updating software. If you have any questions reach out to us via email. We fully stand behind our products. Currently works with ForeFlight Synthetic Vision. Thank you for your interest - Grant and Everlast Concepts LLC. If you have any questions about this product by Stratux, contact us by completing and submitting the form below. If you are looking for a specif part number, please include it with your message.